We pride ourselves in delivering all original recipes, packed with bold flavors, and fresh, easy-to-find ingredients. Nothing says creative like an abstract twist on a traditional classic! Jerked Seared Scallops, Tri-Colored Cauliflower Mash, Roasted Cherry Tomatoes & Clover Sprouts. Cast Iron Rustic: Jerk Seared Scallops. Roasted Shallots. Golden Beats. Cherry Tomatoes. Graffiti Eggplant. Rosemary. Thyme. 1. Heat a seasoned cast iron skillet on high and preheat oven to 350 degrees. 2. Lightly sauté kale on medium heat for about 3 mins or until kale cooks down a bit. Once it has cooked down, set aside and begin building your cream. 4. Prepare Chicken: Once cleaned, cut horizontal slits into chicken breasts (skin side up). Fill breast slits with marjoram leaves and butter, and generously seasoning with salt and pepper. Sear skin side down, 3-4 mins on each side, then finish in the oven for 35 minutes or until chicken has browned and reaches 165 degrees. Add about an inch of seasoned water/ chicken stock to the pan, being sure to base every 4-7 minutes, to avoid drying out the chicken. 5. Roast Veggies: Lightly drizzle veggies with olive oil, and season with marjoram leaves,salt and pepper. Be sure to massage flavors into the veggies, and roast in oven on 400 degrees for 25 minutes. 6. Build sauce: Heat sauce pan on medium heat. Add 4 tbsp of Maple Almond Butter, 2tbsp of honey, 2tbsp of soy sauce, 3tbsp of Sriracha and about 1/4 cup of water. Reduce until thickened. 7. Once chicken is cooked to 165 degrees, use a chef's knife (or whatever you have) to cut off the top layer of the chicken. You want to cut against the bone, removing the top layer of chicken, being careful to keep the skin on and intact (for easier plating). 8. Plate, garnish and serve. 1. Pre-heat oven to 350 degrees. Bring 1 cup of water to a boil in a stock pot. Season water with all dry seasonings. Once boiled, add chopped cabbage. First the green, then the red (particular placement helps to determine how well the colors mix). After about 10 minutes, add your carrots, onions and peppers, being sure to season once more (everything that hits the pot should always be seasoned). 2. Heat a sauce pan on medium heat and add 1/2 cup of water. Once it starts to bubble, add chopped beats. After 10 minutes, add one table spoon of minced garlic, 1/2 cup of sangria, 1 tbsp of water and about 2 tsp of lemon juice. Let reduce until sauce has thickened a bit. 3. Use an immersion hand blender to muddle the beat sauce. Be careful not to blend smooth. You're looking for muddled pieces of beets in your sauce to add an extra layer of texture. 4. Put ground turkey meat in a bowl. Season with all dry seasonings and add 3 tbsp of Worcestershire sauce. Add 1/2 cup of bread crumbs and 1 egg to bind it. Gently fold, and let rest. 6. Spray cookie sheet with non-stick cooking spray, and arrange turkey bites about 1-2 inches apart. 7. Bake in oven for about 30 mins, or until turkey bites have reached 165 degrees. 1. Add salted water to a stock pot and set to boil. Once boiled, add whole peeled potatoes and cook til tender. 2. Heat oiled skillet to medium heat. Once hot, add chopped veggies. Sauté and season in dry spices for about 5 mins or til al dente (fancy for: cooked with a slight crunch). Set aside to use later for meat mixture. 3. Brown your meat. Add ground beef and sweet Italian sausage to a hot oiled pan. Add all dry spices and use a spoon to fold in the flavor. Once browned, add the veggies that we set aside earlier. Combine and cook together until veggies are tender.-- The veggies become flavor-absorbers, locking in all of that deliciousness from the meat. 4. Once potatoes are tender, drain water and mash with a wooden spoon or a potato masher. Once mashed, Add 1 cup of heavy cream, 1/2 cup of sour cream, 2 Tblsp of butter, salt, pepper, dried parsley and shredded cheese to taste. Use an immersion hand blender to achieve a creamy texture and to ensure that all of the ingredients are successfully combined. The potatoes should have a nice velvety whip to them. 5. Pre-Heat your oven to 350 degrees. Take a loaf pan, and layer the bottom of it with a very thin layer of mashed potatoes. Next, add your meat and veggie mixture. Be sure to dense pack the ingredients into the loaf pan using the back of a serving spoon. It is important for everything to fit nice and tight into the pan to achieve equal distribution of heat. 6. Add a generous layer of mashed potatoes to the top, and put in the oven and bake for about 15 mins. 7. Next, set your oven to broil for about 3 mins, to quickly brown the top of the pie. 8. Remove from oven, garnish, plate and enjoy! 1. Build sauce. Combine jerk seasoning, brown sugar, molasses and water. Whisk until sauce thickens to pasty glaze texture. 3. Use food processor (or a knife) and shred half of a head of red cabbage, and 5 carrots. Add vegetable oil, salt, pepper, Adobo, juice of half of a lemon, Apple Cider Vinegar and gently fold in flavors and refrigerate. 4. Cut sweet ripe plantains into little medallions. Heat pan with oil, and fry for about 3 minutes on each side. You're looking for a nice golden brown color. As Chef Andrew Zimmern told me on episode 4 of Food Network's All- Star Academy, "Brown is the color of flavor". 5. Use a circle mold or cookie cutter to cut small circles of Mehti Roti. Lightly brush with melted butter and a pinch of curry, and let brown in med heated pan. Do about 20 seconds on each side, or just long enough to get some color on both sides. Leaving it in the pan for too long will cause it to get too hard, making it difficult to eat. 6. Heat oil in stainless steel stock pot on medium heat. Once oil is hot, add marinated pork to brown. Once browned, add 2 cups of water, stir and cover. 7. 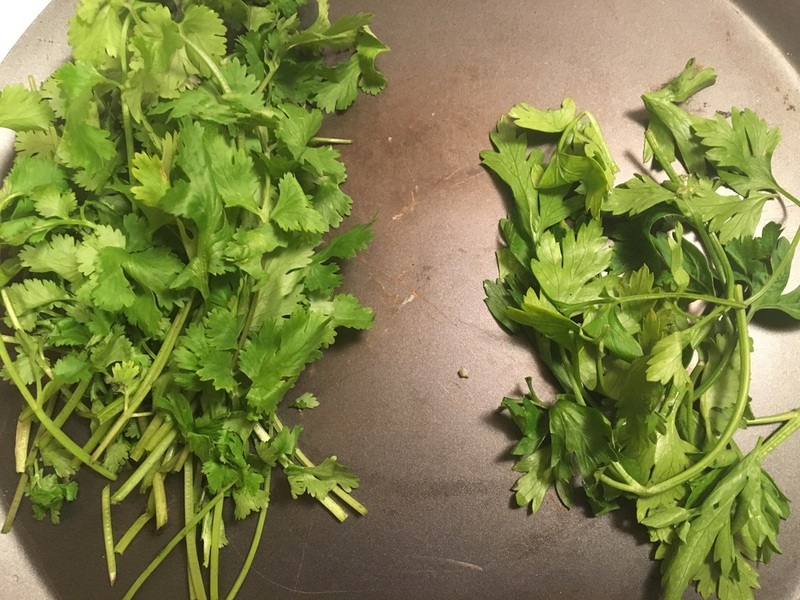 After about 20 mins, add 1 chopped scotch bonnet pepper, 3 branches of Thyme, and 3 branches of cilantro, chopped peppers and onions, and remaining sauce mixture. Let simmer for an hour or so. 8. Plate, garnish and enjoy! 1. Add water to a stock pot, and bring to a boil. 2. Add all dry spices and ingredients to taste. Be sure to season generously...never be shy when building a broth or stock. The secret to any great soup or stew is a flavorful broth. 3. Once water has changed to a reddish/orangegy (old bay + Paprika) colored bath of goodness, add onions. 4. Next you want to add the juice of half of a lemon, and drop the squeezed lemon into your broth. 5. After, add (1) cut up scotch bonnet pepper followed by (3) dabs of Worcestershire sauce, 5-10 daps of fish and meat sauce, 1 tspn of minced garlic, finger length of ginger paste and about a table spoon of sugar. 6. After about 15 mins of bubble action, add your chopped potatoes and green ripe bananas (plantains). 7. After about 15 more minutes, add your Hake filets. Turn heat down to low, cover with a pot top, and let it go for about an hour or so. 8. Turn pot off, plate, garnish and enjoy! For anyone who knows me, you know that I LOVE me some curry chicken! 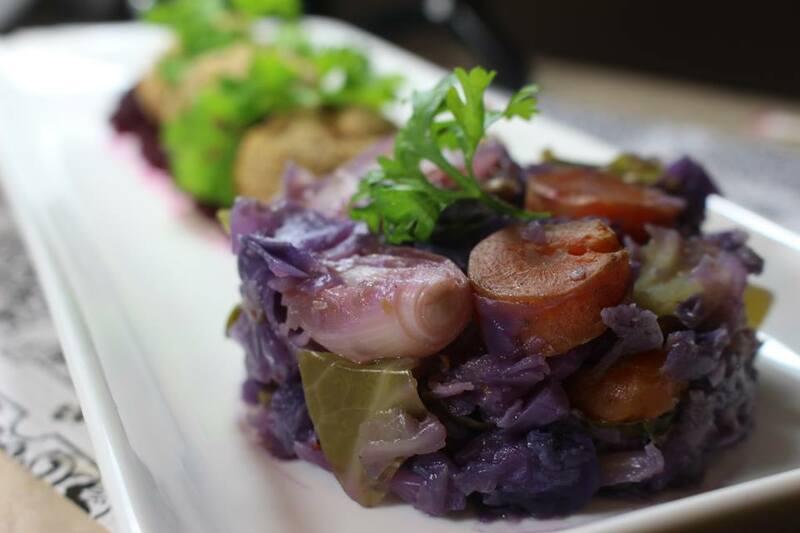 Something about the Indo-Caribbean flavors and the comfort food feeling, gets me REALLY excited about the dish. Growing up in South Side Jamaica Queens, I grew up around a LOT of indo-Caribbean food. Not only did we have about 3 Caribbean families on the block, but there were tons of West Indian restaurants between 140th and Rockaway, and Crossbay Blvd. There were tons of restaurants serving Jamaican food, Guyanese food, Trinidadian food, and everything in between. Curry chicken quickly became a favorite of mine, and it wasn't too long until it became one of my signature dishes. Taking a traditional dish in both Indian and West Indian cuisines, and blending both Indian spices, and Jamaican spices, this dish quickly became a fan favorite. Check out the Recipe Below! 1. Get some oil going in a stainless steel stock pot on medium-high heat. Once oil is hot (back up and do the spritz test), begin building your curry sauce by adding both curries, turmeric, all dried spices, and the scotch bonnet pepper. 2. Add seasoned chicken ( keep seasonings simple, just salt and pepper so that it doesn't compete with the curry) into the sauce mixture, and season generously with same seasonings on top. 3. Once chicken has browned a bit on one side, add water to stock pot. You want to add enough water to be able to see parts of the chicken surface. Let boil for about 15 mins, then add more herbs, garlic salt, and black pepper to taste. Cover, and let boil for about 15 more mins. 4. Next you want to thoroughly rinse your chick peas with cold water in a colander. This removes the bitter taste from the canned juices. Chick peas are great for absorbing flavor (especially curry), and they hold well with other vegetables. 5.Add Chickpeas to pot, add about a tspn of Sea Salt, and cover for 15 mins. 8. Remove from pot, garnish, and serve over white rice! I guarantee this will be the BEST curry chicken you have ever had! Don't Let Your Herbs go to Waste! After creating a Southern Italian fusion the other night, I had some left over herbs. Like most of my herbs and veggies, if they're in the bottom veggie drawer of my fridge, they go bad. Why? Because if they're out of sight, they're out of mind. So this time, I put them on my top shelf to increase visibility. Needless to say it worked! I started to notice these herbs didn't have much time left before becoming soggy, mushy green machines. So instead of letting them go bad, I decided to dry them myself, and store them until the next time I needed them. Here's how I did it! 1. Pre-Heat your oven to 200 degrees. 2. If dealing with multiple kinds of herbs, be sure to separate so that you can tell the difference after they've dried. Feel free to remove the stems of you'd like. I kept mine on because there's a ton of flavor in them. 3. Put the herbs in the oven for about 15 mins or until dried. The texture should remind you of kale chips, or a crunchy leaf in the fall. 4. Remove from baking dish and start to break them down. You can toss them into a food processor to get them really fine, or you can have fun with it and break them up with your hands. 5. Once they are broken up, feel free to kick it up a notch by adding spices or other herbs. 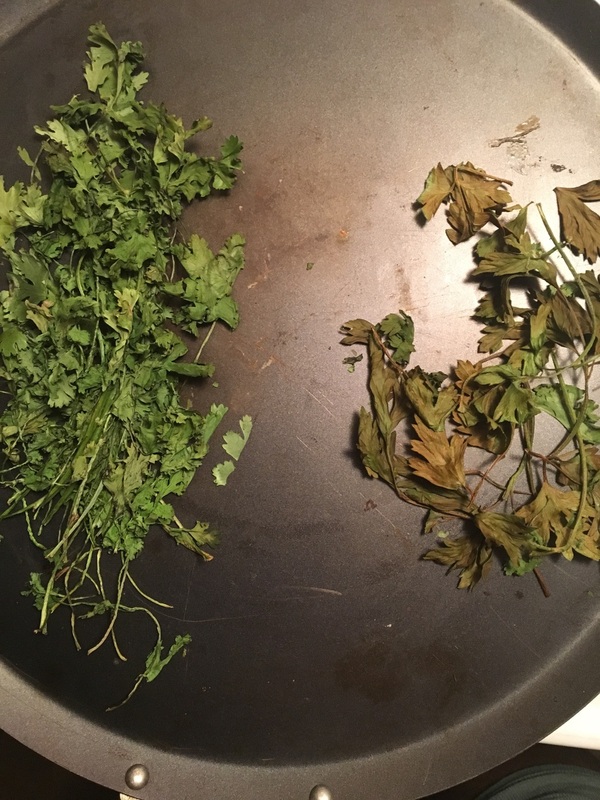 Try a combination of the two to create different homemade herb blends. Be careful though. Dried herbs are a lot more potent than fresh herbs, so be sure to make the right pairings. Seared Chicken Thighs with a Scotch Bonnet Italian Sausage Tomato Sauce, Over Creamy Savory Grits. Talk about "Non-Traditional". This dish is a Southern- Caribbean- Italian fusion. Check it out! Get heat oil in a very hot skillet (be careful for popping oil). Heavily season both sides of the Chicken Thighs with Seasoning Salt and Black Pepper. Sear Chicken for about 5 mins on each side, or until golden brown. Once you've achieved a nice sear, add butter, and place in oven for 15-20 mins on 300 degrees. Remove Italian sausage from the encasing and cook in oiled pan until brown. Add all dry seasonings. Once sausage has browned, stir in a handful of fresh parsley leaves, with finely chopped onions and peppers. For your sauce: I used a homemade sauce, but feel free to use a store bought one. Season your sauce with garlic salt and pepper. Once it has come to a bubble, add scotch bonnet pepper, fresh parsley, and minced garlic. Remove from heat, and stir. Boil about 3 1/2 cups of water. Once boiled whisk in about a 1 1/3 cup of grits. Lower heat, add butter, salt, pepper, and sharp cheddar cheese. Melt butter in skillet on medium heat. Saute veggies in butter on a medium-high heat, and add dry seasonings to taste. Once veggies have caramelized a bit, and still retain a slight crunch, lower heat and add your eggs. Season eggs with dry seasonings, use a wooden spoon to break the yolks, fold in veggies and lightly scramble. Once eggs have been lightly scrambled, add goat cheese, and sprouts. Once eggs are scrambled soft, remove from heat, add shredded cheese, and trap the eggs with a pot top-- This will help the cheese melt using the residual heat, without overcooking the eggs. Once cheese is melted, transfer it to a plate and top it off with a Sriracha swirl. Garnish with sprouts, goat cheese, your favorite greens, serve and enjoy! Can of Goya "Chilies Chipotles Adobados"
1. Ready your crock pot: Set crock pot to high, and allow about 30 minutes or so for the heat to be evenly distributed throughout the appliance. 2. Prep veggies: Rough chop carrots, and onions. Cut potatoes in half the long way, and leave snap peas whole. Put avocado to the side, as you will need to use it later. 3. Add veggies to the crock pot: Because these are particularly thick cuts, you want to let the veggies cook in the crock pot for about 30 mins- an hour before actually adding the beef. 4. Season your beef: Generously season your beef and lightly massage to ensure the flavors are fully absorbed. Add beef cubes to your crock pot, and enough beef stock to fill about half of the pot. 7. After about 30 mins, add a can of Goya Chiles Chipotles and stir. This gives the stew a spicy, smokey Mexican flavor. Be sure to add ALL the contents of the can, as the Adobo Sauce is key to achieving that authentic Mexican flavor. 8. Go live your life for the next 5 hours (do laundry, pick up the kids, read a book...you get the point lol) and let your crock pot work it's magic. Since the crock pot cooks slowly to retain your meal's natural flavors, it relies on the internal heat. Because of this, avoid opening the lid. It's going to need all the tender, love and HEAT it can get. Once 5 Hours is up, plate, and garnish with watercress, parsley, avocado, and enjoy! Remove the pit from a couple of apples. Skinning the apples is optional, but since I like a little texture in my applesauce, I keep the skin on. Cut apples into small cubes/ chunks. Be sure to cut them all relatively the same size to ensure that they all cook through at the same time. 2. Add apples to a pot of boiling water and a table spoon of lemon juice. Coat apples with a generous amount of sugar. 3. Once the apples have cooked down a bit, and the sugar has dissolved, add cinnamon, nutmeg and cover. 4. Once bubbles begin to form, and liquid starts to thicken and reduce, stir apples, put on low and let simmer. You can set it and forget it for about 15-20 mins. 5. Once apples have cooked down and achieved that "apple sauce" texture. Remove from heat, let flavors rest, refrigerate, and serve! 2. Brown roast on ALL sides in a pressure cooker. 4. Cover pressure cooker, and let cook for 1hr and 20 minutes. 5. After the allotted cooking time, use a fork to check tenderness. If the fork goes through seamlessly, then the roast is done. If it is difficult to get the fork through, cover again, and set for an additional 30 mins, or until tender. 6. Once Roast is finally tender, use a spoon or baster to baste the roast. You want to baste multiple times, every 2-5 mins. Once the roast is moist, and completely saturated in the sauce, carve and serve. Put wings in bowl and generously season them with Pickle Masala, Indian Curry Powder, Chicken Tiki Masala, Turmeric, Poultry Seasoning, Black Pepper, Seasoning Salt and Black Sesame Seeds. Prep for frying. Add flour, Seasoning Salt, Black Sesame seeds, and mix. Heat vegetable oil in pan on a medium-high heat. Toss chicken wings in flour mixture, being sure to dust off any excess flour. Once pan is hot (do the spritz test, and BACK UP, lol), use tongs to lay wings in oil, one at a time. Since we are not "deep frying", be sure to check wings every 2-3 minutes, making sure they are GOLDEN brown on each side. Once they are golden brown, remove from pan and let them rest on a bed of paper towel. Build Sauce. Sautee veggies, and minced garlic and fresh parsley. Once they've softened a bit, add sauces in THIS ORDER: Tamarind Concentrate, Szechuan Spicy Sauce, a Dash of Soy Sauce, and Organic Sriracha Garlic BBQ Sauce. Let sauce simmer. Once the veggies have softened, and the sauce has begun to reduce a bit, add 1/4 cup of water, and more Sriracha BBQ Sauce. Once your sauce is ready, lightly toss wings in sauce and serve. You may also choose to leave wings as is, and use sauce for dipping. This can prevent chicken wings from becoming soggy, and allows guests to use as much or as little sauce as they please. Season Salmon with dry seasonings. Brush Salmon generously with Saigon Sizzle Glaze. Wrap in foil and add about ¼ cup of seasoned water to the pan. Bake in the oven on 350 degrees for 8 mins. Sautee spinach, corn, onions, dill and minced garlic in vegetable oil, being sure to retain some of the onion’s crunch. Remove foil, brush Salmon with more Saigon Sizzle Sauce and put back in oven for about 1 minute. Plate, garnish with avocados wedges and dill and enjoy. 1. Boil pasta in salted water until tender. 2. Build your Cheese Sauce: Heat milk, lots of cheddar cheese, goat cheese and seasoning in a sauce pan. Once cheese is melted, slowly stir/whisk in flour to thicken. 3. Pour pasta into a baking pan, add seasoning, cheese sauce, all cheeses, and a nice creamy layer of cottage cheese. 5. Add a generous layer of your cheeses (excluding the cottage cheese) to the top and dense pack it into a muffin/cupcake tin. 6. Slice pepper Jack cheese into small rectangles (or thinly shred) and layer to allow cheese enough space to melt. 8. Pull out, top with extra cheese sauce, garnish with crispy bacon and serve! Bring a pot of water to a boil. Generously add all dry seasonings. I recommend generously seasoning soups, but be sure to season to taste. Prep Veggies. Remove Swiss Chard and Kale from their stems and give them a rough chop. Blanch greens in boiling broth. Be sure to continue to season generously between each step. Add corn and Asian chopped suey vegetables. Add onions toward the end and add more curry powder until soup begins to shine a golden yellow and broth begins to lightly thicken. If desired, this dish goes great with chicken. Add baked chicken and let simmer slow for 15 mins. Brown Sugar Jerked Salmon With pickled radishes and Sautéed Kale and Swiss Chard. Build sauce. Whisk jerk seasoning, scotch bonnet sauce, brown sugar and oil in a bowl. Lightly season salmon with Sazon Completa. Fully submerge salmon in sauce and refrigerate for 15 mins. Oil pan and brown garlic. Add veggies and season with all dry seasonings. Sauté until greens are cooked down and retain a slight crunch. Lightly Sauté radishes separately. Season with salt, pepper and sugar. Bring vinegar, sugar and water to a simmer. Cut up radishes and soak in mixture. Remove salmon from fridge. Add water to pan and bake for 15 mins on 350. Base salmon in sauce every 5 minutes, being sure to keep salmon flavorful and moist. Remove salmon, arrange radishes and lemons, plate and enjoy.